This page was originally written for Tolerating Uncertainty. See Tolerating Uncertainty webpage. 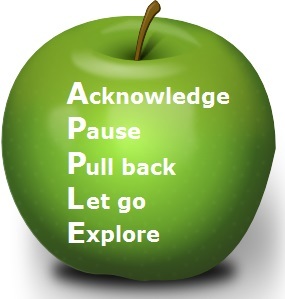 APPLE can be used as a response to any unhelpful thought or feeling. APPLE helps us respond mindfully and more effectively to unhelpful thoughts and feelings. Using APPLE all day keeps the doctor away! PULL BACK - Tell yourself this is just the anxiety or depression talking, and this thought or feeling is only a thought or feeling. Don't believe everything you think! Thoughts are not statements of fact. LET GO - Let go of the thought or feeling. It will pass. You don't have to respond to them. You might imagine them floating away in a bubble or cloud. EXPLORE - Explore the present moment, because right now, in this moment, all is well. Notice your breathing, and the sensations of breathing. Notice the ground beneath you. Look around and notice what you see, what you hear, what you can touch, what you can smell. Right NOW. Then, SHIFT YOUR FOCUS OF ATTENTION to something else - on what you need to do, on what you were doing before you noticed the worry, or do something else - mindfully, with your full attention.